The first episode holds a lot of promise for what could be a very thrilling and unique show. From the opening credits, viewers of Kiss Me First know they are in for something eerie: virtual, unsettling bodies rise up and form out of some kind of liquid substance. As well as being particularly disconcerting, this introduction to Channel 4’s new show is a nod towards the show’s USP: VR, or Virtual Reality. The plot focuses on a young woman, Leila, who, recently bereft of her mother and isolated from the world around her, finds comfort and friendship in a VR game entitled ‘Azana’. However, after meeting the enigmatic Tess, known as Mania within the game, she soon stumbles upon a hidden area, frequented by only a handful of mysterious players; each sports a gadget known as the ‘Azanaband’, which inflicts real ‘pleasure and pain’ on the wearer to emulate what their in-game avatar would feel. Leila, often referred to in the first episode by her username, Shadowfax, is instantly drawn into their world, desperate to find out more about this strange group, who call themselves ‘Red Pill’, as well as more about the real players behind the avatars. With the show’s emphasis on VR as the integral component of the plotline, it must be noted that the use of graphics within the show is absolutely stunning. 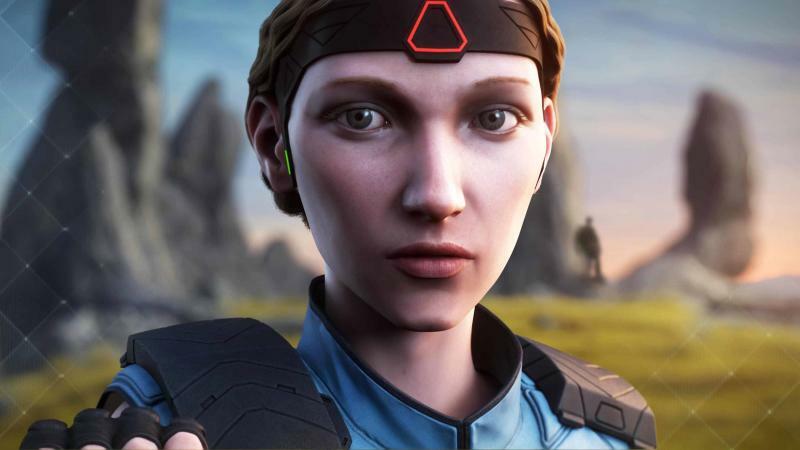 The fictional ‘Azana’ is designed to look like everything real-life VR should be, yet can’t be whilst we still wear those clunky and, at times, uncomfortable headsets. The animation of the in-show game is state of the art and wouldn’t look out of place at all in a standalone film/TV show/game; in fact, the style is not totally dissimilar to current gaming phenomenon Fortnite, if not a little more detailed. Furthermore, the juxtaposition between live action and animation is seamless. Where the actual plotline is concerned, all I can say is the first episode raises many questions and provides very few answers. This consistent lack of knowledge can be very frustrating as a viewer, as there are several elements of the plot which you simply can’t make full sense of at the present, although you presumably will be able to as the series progresses. Yet, while you struggle with an urge to scream at the TV screen, just like Leila, you too are drawn into this VR world, eager to delve further into its secrets. Very little information is divulged about the secretive Red Pill group in this first episode; all we find out is that their name is a reference to the pill Neo takes in The Matrix in order to acknowledge reality and regain his freedom from the dream world, as opposed to the blue pill which would have allowed him to remain in the comfort of a simulation. This is presumably why they wear the illegal sense bands, but at this stage we can know nothing more than this. Kiss Me First is certainly interesting, given its unique focus on virtual reality, and the viewer is compelled to keep watching in order to make sense of the VR world within ‘Azara’ and the mysteries surrounding it. Outside of this, the story is unfortunately not quite so captivating. The dullness of Leila’s real life is, of course, in place to contrast her far more exciting virtual existence. However, in the first episode at least, I find it to be a little too dull to fully hold my attention. Nonetheless, if you have any interest in gaming and virtual reality, the show is definitely worth a try for the impressive graphics alone, and the concept will certainly keep me watching for at least a few more episodes. This episode acts as a set-up, and with its dark, shock ending reminding us of the show’s thriller genre, I really hope that the series will soon find its momentum. Kiss Me First airs every Monday at 10pm on Channel 4. The first episode is now available to watch on demand on All 4.